Ian R. Crocker, MD, professor in Winship Cancer Institute's Department of Radiation Oncology, will retire this week after three decades of caring for cancer patients and developing innovative therapies. Crocker, who is board certified in internal medicine and radiation oncology, joined Emory University in 1986. Over the years, he has been instrumental in implementing and refining many treatment programs used in the management of patients with brain or eye tumors. He was the first doctor in the United States to implement image-guided radiation therapy (IGRT) for patients with brain tumors using the Varian On-Board Imaging System. Crocker is a co-founder of Velocity Medical Systems, an Emory University-based start-up company which developed software to manage imaging and other medical information and which was subsequently acquired by Varian Medical Systems. He was also a co-founder of the Novoste Corporation, the lead company focused on intravascular brachytherapy, and a leading expert in this technology. 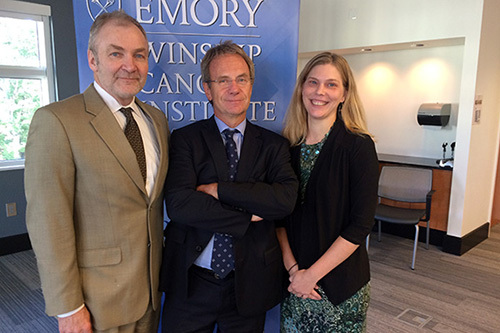 "Ian has been a transformational leader of radiation oncology at Emory and for our nation. His low-key approach to life belies an amazing intellect and curiosity and a series of unparalleled career accomplishments," says Walter J. Curran, Jr., MD, chair of the Department of Radiation Oncology and executive director of Winship. Crocker, a fellow of the prestigious American College of Radiology, is also a member of the American Society of Therapeutic Radiology and Oncology, the European Society of Therapeutic Radiology and Oncology, the American Brachytherapy Society, and the International Society of Stereotactic Radiosurgery. He has been recognized as one of the best doctors in Atlanta, as well as one of the best doctors in America in his specialty field. Pictured: Crocker (center) with Winship executive director Walter J. Curran, Jr., MD, and Kelli Gress, clinical administrator for the Department of Radiation Oncology.